Proper food handling depends on properly-gloved staff, and with these extra-large Noble Products vinyl gloves, you can rest assured that all of your food-handlers will be in compliance at all times, thanks to the powder-free, latex-free design of these gloves. These non-sterile, multi-purpose gloves offer a consistent fit, with the flexibility and resilience that your establishment depends on. For peace of mind, Noble gloves comply with California Proposition 65 and do not contain DINP. We love these gloves! We use these gloves day in day out in three different sizes. They are easy, perform well when in a hurry, and are very comfortable. Quick access box is great, and the price is just as nice! The Noble Products Disposable Gloves work very well and shipped well. It is not the best Powder-Free Disposable Vinyl Gloves out there but definitely worth the price. I stock pile them in various sizes for using in my restaurant. These fits smaller hands just fine. At 3.5 mil thick, liquids does not soak through easily and it's pretty hard to rip these gloves working. These Extra--Large Powder-Free Disposable Vinyl Gloves were perfect! Finally we found a glove large enough for my husband to wear while cutting up samples! He was very pleased with the fact that they didn't get white powder all over his shirt! They were easy for him to put on & remove. Customers really noticed & appreciated the sanitary work environment too! Noble powder free extra large gloves are the best gloves to buy for food service. This extra large size is a great size to buy that will fit anyone’s hands and they are so easy to remove. Cheap price for a glove, but these really hold up well. Since we are changing our gloves constantly the price makes it perfect. We buy all the sizes available. Perfect is very good product, excellent quality and the price is very good. I liked them a lot, I definitely recommend them 100%. Thanks a lot! These extra large vinyl gloves are quality! They are so durable and hold up for longer than your other brands. Buy extra large and it fits just about any size hand. These are great for a busy kitchen and they hold up very well and are very durable. They are exactly as described in the description. The gloves are great for me as I have what I consider very large hands . They are durable even with my wedding ring land my long nails . These are my new favorite gloves . The Extra Large Powder Free Disposable Vinyl Gloves really one in handy for myself and my husbands treat making business. It keeps our hands clean while coloring fondant by hand as well as keeps the food safe. Great purchase! Order these through Webstaurant because they are less expensive than any local source I use, even when you include the shipping. This is a standard item that matches the quality of the same product you would buy through any mainline distributor. Since this is powder-free, everyone that works in the kitchen loves it and the quality is perfect. We very much enjoy this product. So glad. These gloves are great. They work amazing and come filled which is great because we go through them like crazy. I would highly recommend these. These disposable gloves are the real deal, and the price can't be beat, they hold up as well as the pricey gloves, our staff loves them too. We use these gloves for all operations in the café. They are great quality and they are affordable. I buy them in all sizes and my employees love them. Durable and easy to use and change. Do not tear or rip easily when putting on. Quality gloves for the price, comes in all different sizes as well. I've tried a lot of different vinyl gloves before we starting using these. These reason I started looking for a new brand is because all of the other ones would tear really easy. These are much more durable. When putting the gloves on make sure to pull down from the palm not the cuff and you want have any issues. These gloves are pretty good but we prefer item #3941085XL as they are easier to get on when hands are wet or when in a rush. This glove is great quality and fits the biggest hands in our kitchens. It's important that everyone has the right size glove especially when handling a knife. One of our cooks is over six foot three and these extra large gloves hold up and do not rip. With the amount of baking that we do it's crucial to have gloves that will stay on for batches and batches of cakes because no skin to food contact can happen. Highly recommend these for anyone who is doing a lot of cooking/baking using their hands. Powder free seems to be what our people want and helps them to do a better job in the kitchen. We highly recommend this item. Love these gloves the x large fit perfect for my larger size hands. They don't leave any residue on your hands like the ones with powder. Work great. They're gloves and they are latex-free for employees or customers who have latex allergies. My hands are large-ish and the XL fits well. Each glove fits well provided that the right size is chosen. There’s enough flexibility where fingers don’t feel trapped or restricted allowing for a full range of motion. We love these gloves! They fit well, easy to put on, and take off. They didn't tear, and they held up after hours of use. A+ item as described. We are using these in food prep and serving. Nice material that holds up. I purchased in a variety of sizes (s, m, l, xl) to make sure they fit all of my employee's hands'. Also a good idea to purchase the wall mount for these boxes. Great gloves for a man's hands, my husbands hands are between a size large and these fit perfect and they stay on. They also come off nice. We use these extra-large powder-free disposable vinyl gloves very often at my cafe and I would definitely recommend this product! WebstaurantStore always has fast shipping and is consistently reliable! Can't find the extra large size anywhere locally, so I started ordering them here. Quality is great, shipping is fast, price can't be beat. Perfect! Got the Extra Large size for my husband and fits him perfectly. He does not have huge hands, I would say normal size man hands. Gloves have not torn while in use. Easy to put on and easily come off. Box that they come in are easy to open and just grab once at a time when needed. These gloves are functional, but not the best. The part of the glove that should secure to your wrist to keep the glove from slipping tends to be too lose. They are good for short projects, not long term wear. These are a great quality glove and work great for anyone allergic to latex. They do not get holes in them as you are working which I have found with latex. The perfect gloves for these banana hands that I have. Slip on and off easy. They are also big enough to fit over a chainmail glove. These fit our employees' hands easily and are very comfortable. They do not tear or rip easily. They are great quality at a very low price. These powder free disposable gloves do not leave that white mess on your hands. They are safe for handling food . The extra large size fits all. The gloves fit great with my big hands. They don’t tear after a long use and are comfortable. The gloves are powder free and slide right on as long as your hands are dry. These vinyl gloves are very nice to work with, the staff loves them and I love the price. Can't find a better glove at this price. These gloves are great... easy to put on, take off, and affordable. I like the fact that they aren't powdered either so we don't have to worry about a mess! Absolutely great gloves. hands down the best. thanks for a great experience. I will definitely be reordering these. Fast shipment. thank you for a great product. Great product they are durable, price is so much better then from any other source. They fit we'll and fixable. We had been buying them for years. You can't go wrong with them. If you want to show a clean impression no matter your business type is , you need to buy these gloves. They are comfortoable to use and very useful. Recommended and great price. This was a quick shipment, This product is a great quality. It does exactly what they need to do. I would definitely buy these again. Everyone who uses these gloves love them, especially for the price. True to size, but they do not have as much elasticity as latex gloves, so if you're in-between sizes, size up. 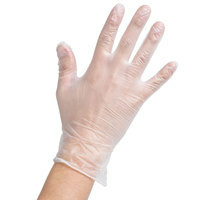 These disposable vinyl gloves are perfect for cleaning or general food service. Comfortable fit and easy to get on. These are fine for light duty uses though not as durable as latex or nitrile gloves. These extra large vinyl gloves are a nice quality glove for the price. Box of 100 gloves or 50 pairs is a great value and can be used for all sorts of applications from food service to Cleaning. This XL size is the most comfortable for my larger students in junior high, and even a lot of boys whose hands are a bit larger for their body. Just like the usual, it serves its purpose! Very good quality of gloves and a must have product in my business. It is very affordable for its quality. I highly recommend these Noble gloves! These X-Large gloves are great for serving dishes, prepping food or sampling product to customers. They can be re-used if you are careful to take them off and on. I like that they do not contain any powders. We buy at least 5000 gloves a month. The price is great and the quality is awesome. We use them not only in the front of the Resturant but also the back kitchen. These are wonderful gloves! They are perfect for use while spinning cotton candy. I tried other gloves and find these to be the best in my opinion. Perfect. Tear resistant gloves. Great for prep work or grilling. You can feel what you are doing, but they are thick enough to where they will not rip. Our employees love the powder free gloves. They're perfect for all of our food prep. And we love that the come in many different sizes. These gloves stand up great through multiple use, and are perfect for making things like sandwiches and salads! The extra large is nice for the men in our kitchen whose hands are a bit bigger! These gloves are great for some of our workers who need the Extra-Large size gloves. We purchased the large gloves which work well but some needed a larger size. These gloves fit well and are not too bulky. They allow us to maintain food safety when handling ready to eat foods. The price is reasonable and the pop up middle allows us to just pull gloves out as we need them. Recommend. Works great, the XL fits our hands good. Thick enough not to break yet thin enough to feel what you are doing. These are about half the price of comparable gloves at our local supply store. We love this product and use it daily, We are very satisfied with this purchase! We use this amazing product because it is easy to use and you don't get powder all over everything like your clothing. Durable and long lasting, they don't rip to easy when putting them on. Fit snugly and the fingers do not bunch up at the ends at all. The gloves are easy to get on and easy to get off. I don't have any residue on my hands and I have room to move my hands around. I can also grip things just like I grip with my hands. Great gloves that come in various sizes. Great price too! We use these for cleaning, handling food and for any other project where gloves are needed. Perfect item and just the right size for my hands. I use them for food prep and don't have to worry about them slipping off in the process. Great gloves. Easy to use. These are a good value, and cheaper than at my local restaurant supply store. I will buy these gloves again. Have looked locally for gloves and found these are best value, even compared to big warehouse stores. The cooks like them, they hold up well enough for the job. Will be ordering these again. We purchase these gloves over the ones we used to get from our old provider becuase they are the same quality for less than half the price even after paying shipping fees. I absolutely love this product! This noble products extra large powder free disposable vinyl gloves are great for the food service! These gloves are great quality! this is a good glove and has good quality, the price is good too. we use it for food preparing, my employee all love it. These powder free vinyl are great for many uses in our bakery. We use them mainly on the sandwich line and for handling loaves of bread without the concern of latex allergies. These are very large but work well and are flexible and allergen free. The powder in some gloves causes reactions as well as the latex so these are free of both irritants. Great for keeping hands clean and food safe too! these gloves are amazing. i had purchase this glove so many time from you guy and love it every time. i told my friends about it and she is planning on getting some. I can usually find one size fits all anywhere but being able to get the xl size was a big help because one size does not fit all. I use these on a daily basis. They are great for my large hands and are very durable. Best price I could find for these great gloves. Great product, works as expected and is a great value (even with the shipping) compared to the price I pay from my local suppliers. Size works well for multiple users. I use a lot of gloves in me deli, so these are nice and easy to put on and take off as I need them. These gloves have come in handy. I usually use a large glove, but had to have hand surgery and wear a brace for quite a while. Ordering these x large gloves give me the opportunity to put them over the brace and I am able to help out still. Great single use foodservice and kitchen gloves. Purchasing by the case (10 boxes) is a great way to reduce our overall kitchen costs. Will purchase again. The Noble disposables gloves was a great find. They are inexpensive but last as long as I need them. They fit the hand nicely and allow you to work with them on. These Noble vinyl gloves are fine for foodservice or healthcare where frequent changes are needed. Not as durable as latex or nitrile but well worth the money. These gloves work great. They are exactly as advertised and easy to put on. We have experienced very few tears with them and will continue to use in the future. Very Harvey duty cloves, clear white and works perfect. I used it for hours and still holding it up. Give it a try you won't be disappointed. As always, the powder free gloves in vinyl are the way to go. Keep the extra large on hand for those with larger hands, they are also easy to throw on when you are in a hurry, or your hands are wet. We use these gloves for everything and they are great! We have both a deli and do a lot of baking. The gloves fit perfectly and do not rip when you pull them up, unlike some others we've tried. The gloves are not floppy, which while using a meat slicer can become dangerous. We've been using these for quite some time and I wouldn't order any other glove. I use these gloves all the time. Cooking and cleaning alike. Used large in the past, but the extra large are just a perfect fit. They are durable and help minimize cleanup. These gloves are strong and durable. We have several hairstylists with very large hands, and these fit perfectly and have never ripped! We highly recommend these! These are great for what we need them for....as we go through a lot of gloves in our kitchen and need to change them often. Definitely need to buy XL as the M and even the L do not fit the men's hands very easily. nice easy on easy off disposable gloves. we go through so many that its important that we get a good price.. the price on web cant be beat. These Extra Large Vinyl gloves are great. They are very durable for multiple uses from prepping, cooking and even for the clean up afterwards. And a great price. Love these gloves! They are very comfortable. The thickness is great to prevent accidental tears or punctures while still maintaining clarity. They also provide great grip. We use these gloves daily at our small deli. They are very strong and easy to put on when preparing food, Even with shipping costs they were the best price we could find online. One of my ladies uses the extra large gloves in the infant room. Not only are her hands big but she is able to pull the glove off of her hands and over the soiled diaper before throwing it in the trash. Great gloves for dirty tasks. I use them when I am cleaning or when I am polishing my pots. I also use them when I am cooking beets so my hands don't get discolored. I would make sure not to get gloves that are too small or too big- the sizing is important. i love these glove, it fit so well in my hand. i had purchase some of the cheaper stuff before and this is by far the best glove i used. would totally buy again. Prices on paper goods and chemicals are always way out of proportion from traditional distributors and they make a killing on gloves. These gloves are a great economic alternative and are perfect for food service. I have saved at considerably and its the same product. Great vinyl gloves for kitchen used, we use them when making cookie batch, marinating meats, preparing salads and serving food in general in the kitchen. Size is big for people with bigger hands, thanks for thinking about that. Good quality gloves. I use them a lot while cooking or serving foods. Not itchy, and does not stick compared to some other gloves. Will definitely order more. Perfect for volunteers who cook and clean and have larger hands. No more breaking threw gloves that don't fit. These gives are strong and appropriately sized. These gloves are perfect when you have a worker with man hands. For the people with extra large hands that need the comfort of a nonbinding tight glove this is the one for you. We have several sizes of these gloves to ensure a good fit for everyone. They are thin but strong, and we will be buying more. These work great, and are great price. They glide on easily and I have had no problem with them tearing. I do recommend buying a size larger then you normally would. The gloves are great! Fits smaller hands but still able to do daily tasks. I like the powdered gloves because you can slide damp hands in them. Best price we've found anywhere for quality disposable gloves. No powder & slide on easily. We get medium, large & extra large sizes and all of our staff is happy! Great disposable gloves to use in our small deli. Cheapest price we could find. We go through about a case a month and they hold up well. The sizes come in a variety and work well for our employees. You can also use the Noble Products Extra-Large Powder Free Disposable Vinyl Gloves for Food service to clean off the apple iphone 6s Plus. These gloves work great for keeping finger prints off of your phone. We love these gloves. We switched several months ago and have not looked back. Trust me when I say, these are the real deal. Durable and perfect for the kitchen. Nice gloves for the price! Highly Recommend! we always wear gloves when we serve ice cream to our customers, and we love these! It is nice that these come in different sizes too. Finally found a food service glove in XL that didn't tear at the wrist when sliding onto your hand, or tearing between the thumb an index finger. Noble's #394365XL powder free glove was a decent fit on my big hands, and held up perfectly to the wear & tear of performing a variety of tasks in the kitchen. Awesome price on heavy duty gloves. I'll be replacing my current M & L vinyl gloves with Noble gloves in the future. I'm starting my own at home business and these are exactly what I was looking for. I dislike touching raw meat and I also use them to roll my cake decoration. Great product, will definitely be a repurchase. Perfect for working with any cooking items in the kitchen. Keeps hands clean and mess free to save on clean up time. Recommended for future use. These gloves are very good quality. I use many in soap making, they hold up good. A good buy, am very pleased. Thanks for carrying them Webstaurant. These are excellent! They don't stick to each other, and allow enough dexterity for relatively precise tasks without getting in the way. We used more cheaply-made (one-size-fits-all) plastic ones, but our staff prefer these, so we switched back to them. Great gloves at the price, now that our customers are used to the change they find these gloves are perfect for food service. I will say that they tend to fit small compared to our original gloves. These fit like a large compared to our old gloves. We bought a few boxes to figure out sizing before we started buying by the case, but cases are pretty cheap as well. No issues with these gloves. The local restaurant supply store only carries s - m and large so I turn to webstaurant. They are great! These are good for very basic food serving. I have my teachers use them when serving thinks like crackers to the kids. But they are very thin and break easily. Good gloves for the price, nice to be able to order online. Powder free is great, and the gloves themselves stay on without being too difficult to remove. Will buy again. These gloves are pretty good. They don't tear when you using them like some gloves might do. They sometimes tear when you are trying to put them on but other then that there are no problems with these gloves. These work well for big hands. They aren't tight and easy to put on compared to buying a large. Sometimes harder to find being powder free. Awesome price on heavy duty gloves. My food supplier charges an arm and a leg for these things. I can get on here and get them for half of what they charge. It's a reorder every time I get a shipment. These are the best food service gloves I have ever used. I have large hands and have struggled for years using the plastic gloves (that often tear up). They go on easy even when your hands are a little damp after washing. A must buy for those with large hands. I bought these gloves in every size and I believe they all fit very true to size. They are extremely durable with a long cuff and if you buy these in cases its a great saving!! These gloves work perfect for food prep. They fit pretty good unlike some of the others out on the market. No complaints for me just wish the made a XXL sixe as well. These gloves are perfect! We were ordering the medium gloves but they were too small for some people. The extra-large work for everyone. And the fact they are powder free is a huge plus! Great quality gloves. The Noble Brand is now my go to brand for Gloves! I use them while cooking/baking, cleaning, painting, etc. great quality, and great price! Love that they're powder FREE. Finding gloves for our guys with big hands is always a challenge. These are well sized and are easy to get off and easy on. I ordered a case of these. They are durable and slip on easily. Wonderful gloves because they are non-powdered. Pair this with the Noble Wire Wall Mount Glove Rack, and you're ready to go on the food service line. We didn't have a single one rip during the five days of camp! Value=quality! These gloves are good quality that I did not expect at such a low price, but they are very durable and true to size. Recommend. These gloves work great. They come in a small box rather than a larger one with more gloves. They fit great in the wall rack that I bought. At first, I thought they were going to be way too big, but for those male employees with large hands they work great. These powder free vinyl gloves are very durable and I can't beat this price anywhere and believe me I've tried to find them at the same price or cheater with my local wholesalers but no can do! These are good quality vinyl gloves and they don't tear as easily as some other brands do. Also, you really get a price break by buying an entire case. These gloves are awesome, the cost is great compared to competitors, the quality is just as good. We buy these all the time and absolutely love them!!! We love these gloves. They are thin enough to decorate our mini donuts by hand and thick enough to not rip or tear. Great pricing as well! Not nearly as great as the slightly more flexible nitrile gloves, but a bargain for casual safety and protection when handling food or low-grade chemicals. Great price for great gloves. We use alot of these so case works great for us. Large enough for bigger hands and very easy to use. What can i say about the noble glove that everyone doesn't already know, we use these like crazy throughout the day i haven't found a better glove at this price yet! My staff was so happy to see these particular gloves arrive. They are very happy with the way these glide on and also do not create any allergies. Thanks! These gloves work great for us. I can put my kands in them and they don't rip open like some other do which is the point of having gloves in the first place. A great bargain... These gloves work very well when my students tie dye and we go through a lot of them. I even gave some to the bio folks when they ran out of theirs. All of these lovely horsdoeuvres were laid out while wearing gloves! Since ready to eat foods can not be handled with bare hands, gloves are an absolute necessity not just in our kitchen but along to every event. Can't live without them! Great thickness and quality. And they are some of the few we've ever found that are actually large enough for someone with big hands ! we were looking for good quality gloves for serving food and found these. they were sturdy and didn't tear easily when trying to put on. they held up well and were a good quality product. would buy again. These gloves are great for the kitchen and for any deep cleaning projects that the staff needs them for. They fit snug but not to the point where they are uncomfortable. We used to buy the large size but now we just go with the XL, they seem to fit every employee pefectly. You cannot beat this value for high quality vinyl gloves. My Sysco rep can't believe how low the price is. Save money and buy these in bulk, you will not regret the purchase. the disposable gloves are a must have so why not have them with a value as well. works great and priced very well. shipped fast. These gloves are a must have for any food service establishment. The vinyl is very comfy and they don't rip or tear. Great price on this site too. These gloves are very economical. I had a problem with the large gloves, but these fit the guys in back perfectly. Shipping isn't too bad with these either! These non-powdered gloves make food safety a snap. They are reasonably priced, easy to use and don't take up a lot of space in your inventory space. We swear by them! I use a lot of gloves in my food business. These are great - good price by the case, decent quality, keeps foods healthy. Sometimes they are packed so tightly in the box that when one is pulled out a few others come out too. If they get soiled you can save them for bathroom cleaning (dispose of afterwwrd of course!). Between all the sizes of these we go through a lot of these and have been doing so for years now. In my experience these gloves have done a great job and given me no reason to question their quality. We use a lot disposable gloves in food prep and have used a lot of other brands. These are working very well and a good price. Great gloves at an unbeatable price! They last longer than gloves that are twice the price! We keep plenty of all sizes in our kitchen at all times. We use at least two cases of these a week , which is to less than we used to due to the fact that they do not tear when you put them on. Great value! I love these gloves! I use them everyday and they are a great value. I recommend getting the wire rack to hold them (keeps them right at hand). These gloves are sturdy and won't rip when you put them on. They don't go on extremely easily but that's true of any food service gloves. We purchase the Noble Powder Free disposable vinyl gloves quite often. They are good gloves and are at a good price. We would highly recommend these gloves. The gloves that your company handles is of the highest quality that we have found, we go through a large number of boxes in a short period of time. I believe that our customer/supplier relationship will last a long time. The best gloves for the price. I've searched many places and found the price for them here to be very competitive with others. Very practical to use and a good buy. Very good product at a great price. We've reordered this item many times because we like these gloves so much. They hold up well for the cooks in our restaurant. Good gloves are hard to find and gave these a try. Great gloves for the money. Durable and stands up to long use and fits well. Will be ordering quite often.Highly recommend.